Would you like to follow Zeppelino`S / Zeppelin-Stüble ? You're following Zeppelino`S / Zeppelin-Stüble and will get its daily lunchtime offers on your start page. In the Steigenberger Graf Zeppelin, in the heart of the city, you can enjoy fine steaks as well as Swabian and international cuisine. 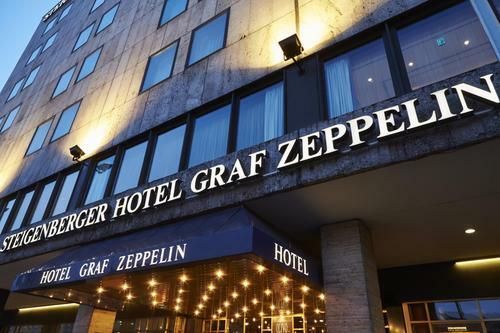 A few steps away from Stuttgart Central Station, in the Hotel Steigenberger Graf Zeppelin, you will find the Zeppelino'S and the Zeppelin Stüble. The Zeppelino'S and the Zeppelin Stüble offer regional and international cuisine, with the highest standards of quality and freshness. The menu offers something from Swabian classics to steaks and seasonal dishes to exclusive seafood for every taste. Special emphasis is placed on the preparation of meat and seafood dishes. The Southbend gas infrared grill with a temperature of 800 ° C ensures that the meat remains very tender and juicy. During the daily Happy Hour from 17:00 to 19:00 you can enjoy selected cocktails at 25% discount!